“riverrun, past Eve and Adam’s from swerve of shore to bend of bay, brings us by a commodius vicus of recirculation back to Howth Castle and Environs. Indeed, as Joyce himself admitted (or boasted), he expected that it would take people fully 300 years to understand the book’s full meaning. And now, as China Daily’s Zhang Yue reports, Joyce’s masterpiece is being translated into Chinese. The first volume has been translated by Dai Congrong, a Chinese language and literature professor of Fudan University, and will be published this month by Shanghai People’s Publishing House. 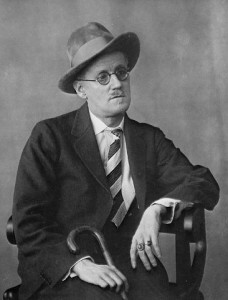 And while Dai’s ten years of work is impressive, it should be noted that Joyce took 17 years to write Finnegans Wake; the French translation took 30 years, the German 19. There is no word as of yet as to when the second volume will be ready for publication. Read Dai Congrong’s paper, “A Chinese Translation of Finnegans Wake: The Work in Progress” here.